This beautiful button was created by Ashley from the School Supply Addict. Also, I made a little freebie for you. It's just like the You've Been BOO'ed product that I posted in October. Except, this one is for Christmas! Download You've Been Elf'ed for free here at my Teachers Pay Teachers Store. Enjoy! 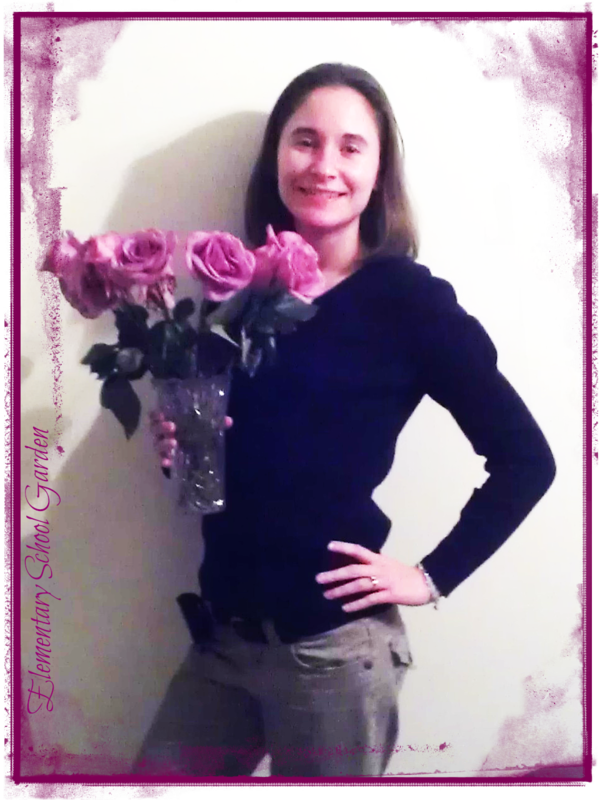 Congrats to Beth for winning my Favorite Author Giveaway. Check your email! I will be sending you a message soon. As soon as I get your address I will send out your books in the mail! Thanks to everyone who entered. I'll host more giveaways in the near future! Sorry for the glare. I'm hoping to get a better digital camera for Christmas. Any suggestions? I'm pretty clueless when it comes to photography but my goal over Christmas break is to learn a little about picture taking. Blog posts are very visual. The first thing I notice when I visit someone's blog are their pictures. I want to improve on my photography skills so that I can provide you with the best blog posts possible. 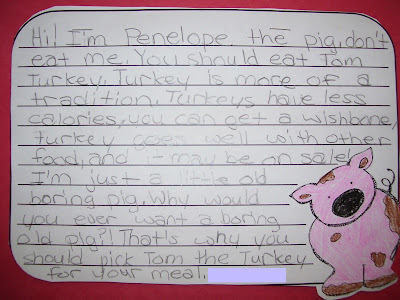 Want to snag my Turkey or Ham Persuasive Writing pack for free? Just be one of the first 3 people to comment and tell me what you are doing next week (in regards to Thanksgiving) with your class! If your considering National Board Certification I can tell you first hand that it was the best professional development that I've ever had. I truly think the process strengthened my teaching and I am a better teacher because of it. I'd be happy to answer any questions that you have about the process. 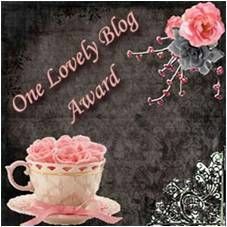 Lastly...don't forget about my giveaway! Check out my previous post to enter before it's too late! 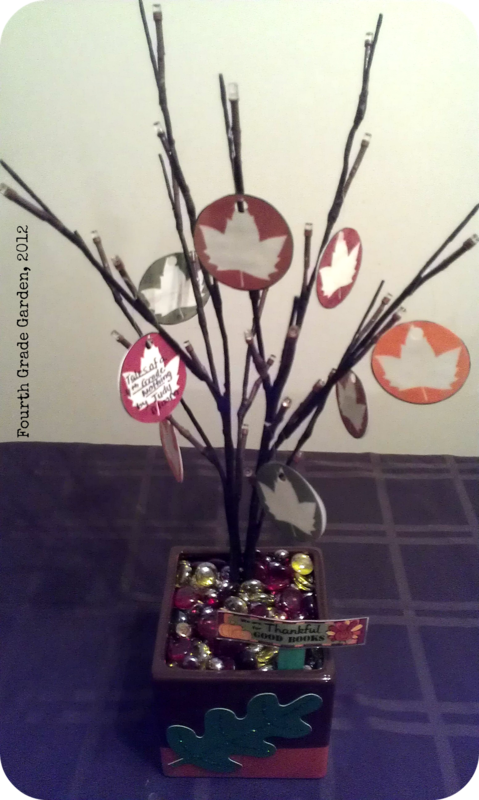 There are still a few more days left to enter my giveaway. 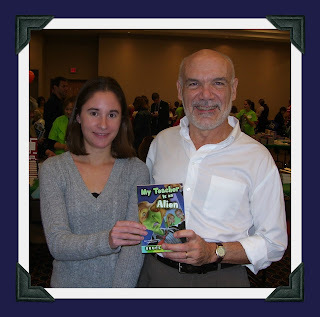 You can win 3 books autographed by Bruce Coville! Check it out, enter, and spread the word! On Saturday, I attended the Rochester Children's Book Festival and had the chance to meet some of my favorite authors, purchase some new books, ask for some autographs, and take a picture with one of my favorite author's of all time: Bruce Coville! Bruce coville is the author of 101 books for children and young adults and has won many children's choice awards, including one of the most recent...an award for "Excellence in Literature for Young People." Bruce lives in Syracuse, New York (not too far from where I live). I was first introduced to Bruce Coville's stories when I was in fourth grade. I read Jennifer Murdley's Toad and was thrilled that my name (Jennifer) appeared in the book. The second I started reading I was immediately hooked. Bruce has a way with words that captures the reader and locks them into the story. Once you start reading, you can't seem to put the book down until you've finished. Each page leaves you desperately searching for more. It's a good thing that there are more than one Magic Shop book in the collection because one was simply not enough. Now, I use Bruce Coville's stories in my own fourth grade classroom. 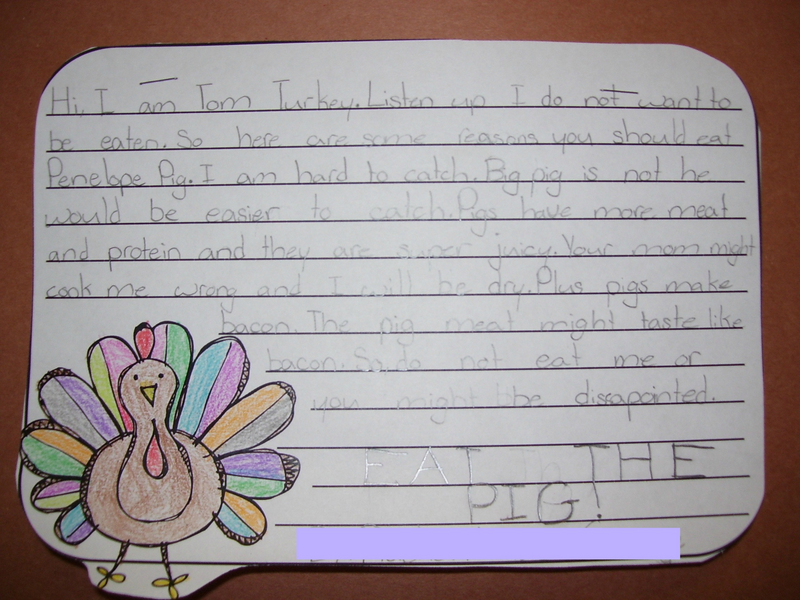 I find that my fourth graders love his stories just as much as I did and still do. My favorite story is Jeremy Thatcher, Dragon Hatcher. 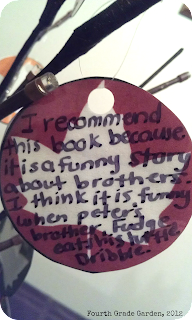 This book is about a boy who stumbles across a magic shop and purchases a mysterious egg. After finishing the book my students always race to the library in search of other magic shop books to read as well. 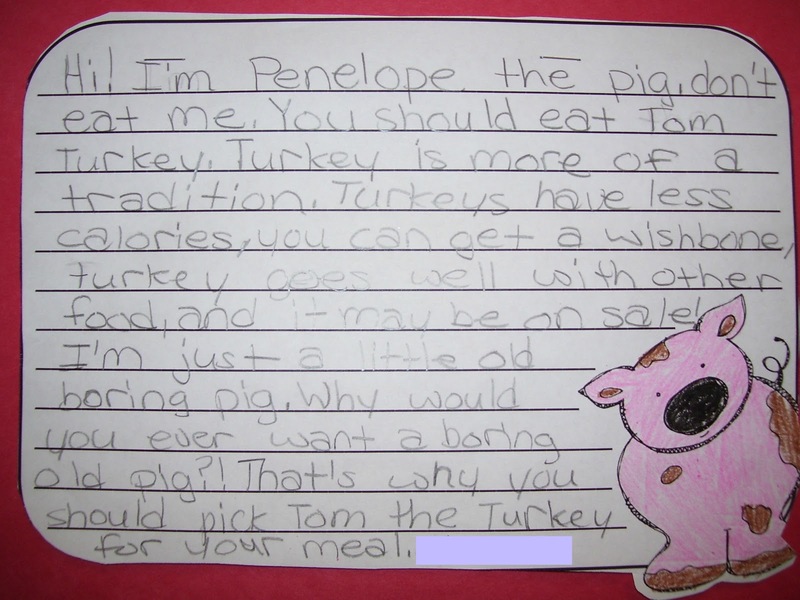 At the end, I have students write a story about purchasing a different item from the magic shop. I also have students create a Guide to Raising a Dragon. My reluctant readers are always thrilled to read My Teacher is an Alien. They love the concept of their teacher being a creature from out of this world. I think by the end of the book they wind up secretly hoping that I am an alien as well. If your looking for a great picture book, check out The Prince of Butterflies. I've read this to my class during our monarch butterfly unit. It is a story about a boy and a migration of monarch butterflies. 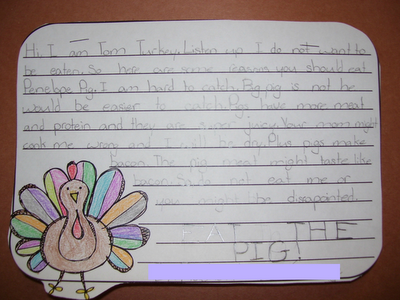 The message behind the story is to stay true to one's heart. While I was at the festival I snagged a few extra books just for YOU! You can win all 3 books and guess what, they are ALL autographed by Bruce himself! Simply enter below with rafflecopter. Looking for something new to read? Check out Bruce Coville's latest story: Always October. This is next on my to read list! I can't wait! Cheers to Honey Bunch Blog Designs for helping me switch over my blog to my new domain: Elementary School Garden. 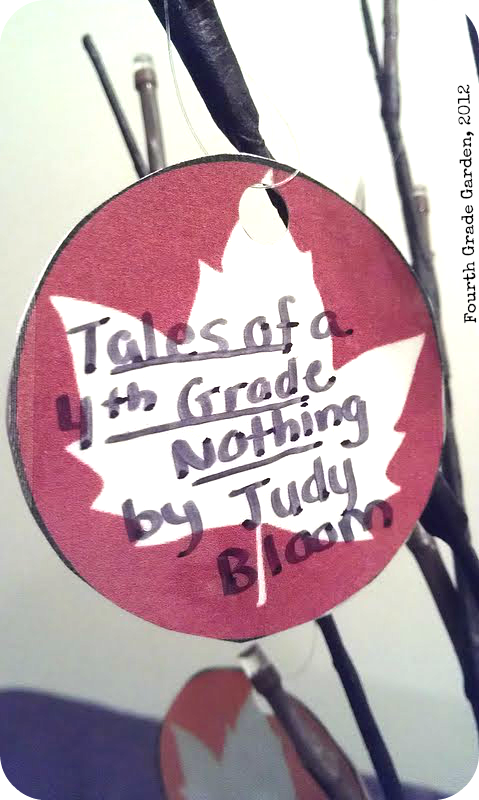 I decided to get rid of "fourth grade" in my title just in case I one day don't teach fourth grade. Hopefully that day will never come. My heart will always be in fourth grade. But hey, you never know. 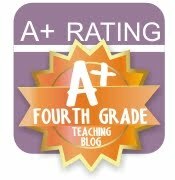 I will be able to continue to grow my blog under my new name no matter what grade I teach. I purchased a domain for my new name. It only costs $10 a year and is soooo worth it. Despite my name change, if you visit any of my old posts or links they will still be available and will redirect you to my new site. $10 isn't bad to keep all my hard work from the last few months of blogging. 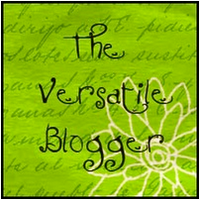 I also decided to scratch the name Liliris and start blogging by my real name, Jennifer. 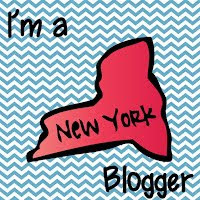 Over the last few months I've become more comfortable with blogging and I'm ready to be recognized by my real name rather than a username. 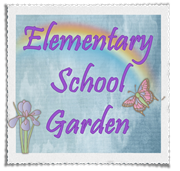 So, when you see the name Elementary School Garden, don't be surprised! It's just little ol' me! Stayed tuned for a giveaway coming up real soon! This past weekend I have been running around like a turkey with her head cut off trying to get all my Monday Made It's post ready in time for Monday. To start off with, I made some more dice shakers to use during the start of our multiplication unit this week. 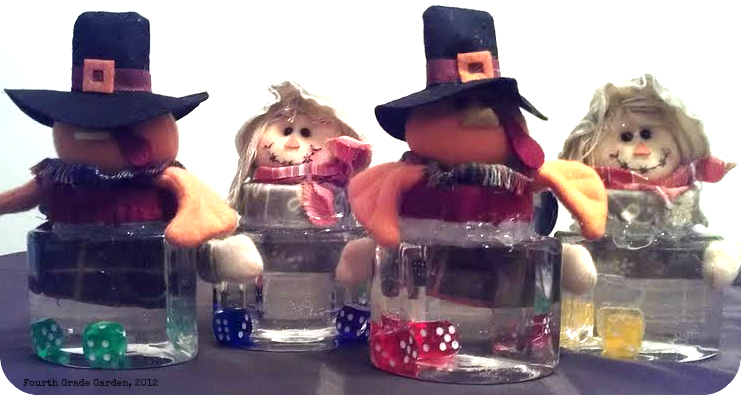 I found these adorable turkey and scarecrow containers at Michaels on sale in the clearance area. 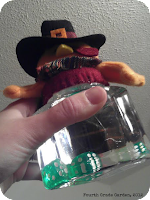 Funny how Thanksgiving items are on sale right along with the Halloween stuff. I shouldn't complain. I swiped them up and got a steal of a deal. 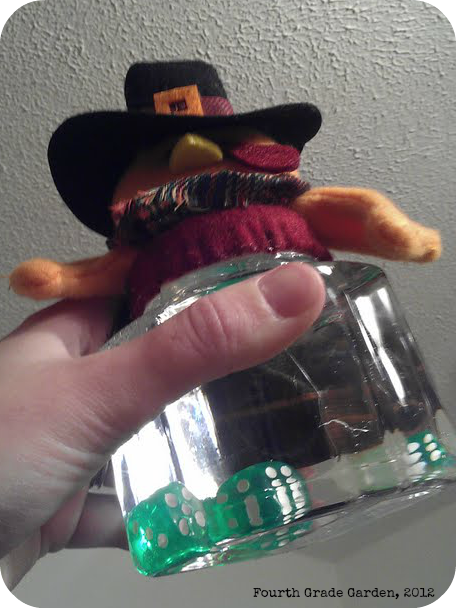 I filled them up with water, plopped two shinny dice in each one, screwed the cover back on and then went around the cover with glue so that they will stay closed tight. Students will start using these little dice shakers this week during our math center rotation. I created a turkey themed multiplication unit to supplement our curriculum. 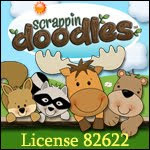 It includes worksheets, games, and centers for multiplication properties and problems from 0 x 0 all the way to 12 x 12. Check it out here at my Teachers Pay Teachers Store. I also created a book review tree. The theme? 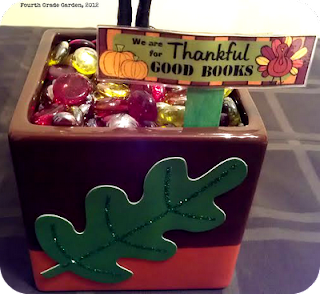 We are Thankful for Good Books. I got the idea for a book review tree on pinterest from Lessons with Laughter. 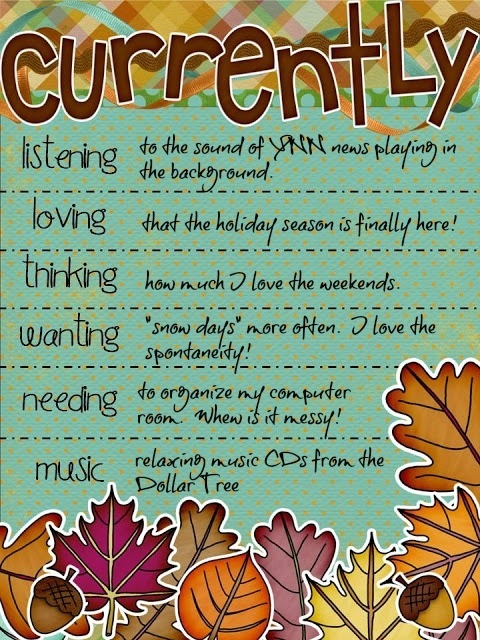 I plan on displaying this in my classroom this week. Students will take a leaf, write the title and author of their favorite book on one side, and why they are recommending it on the other. They will then hang the leaves off the tree. 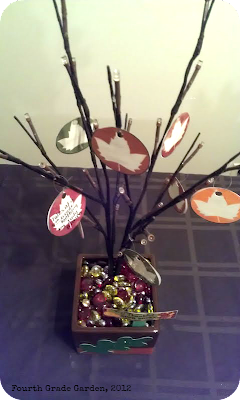 I made the tree with branches from Target. I would have grabbed a branch from our backyard but it has been raining for a week and I wanted something dry. 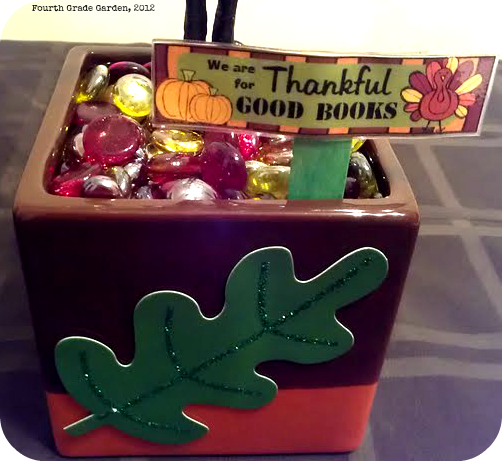 I placed it in a pot I found at Micheals, buried the wires and battery box under some pebbles, and ta da...this is how it came out. Best part is....it lights up! Sparkle sparkle! 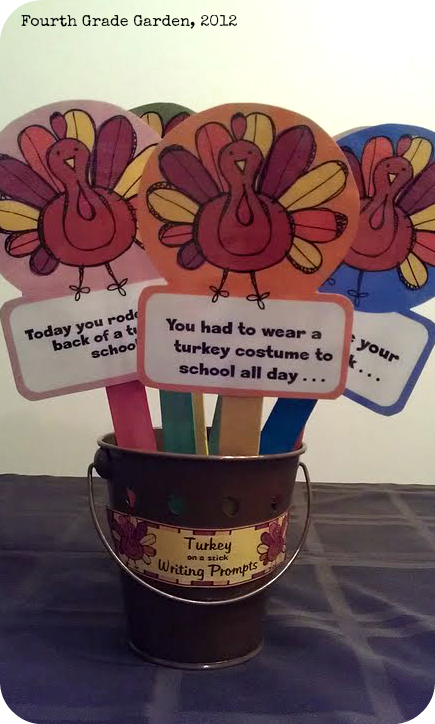 I also created some Turkey on a Stick writing prompts. I plan to have my students use these during writing centers or for when they finish their writing early. I found the cute little pail in the dollar section at Target. Target has all their fall stuff on clearance for 70% off right now. So, the pail only cost $0.30. I have the templates for my Thankful for Good Books tree and Turkey on a Stick Prompts inside my Thanksgiving Writing Prompts pack. 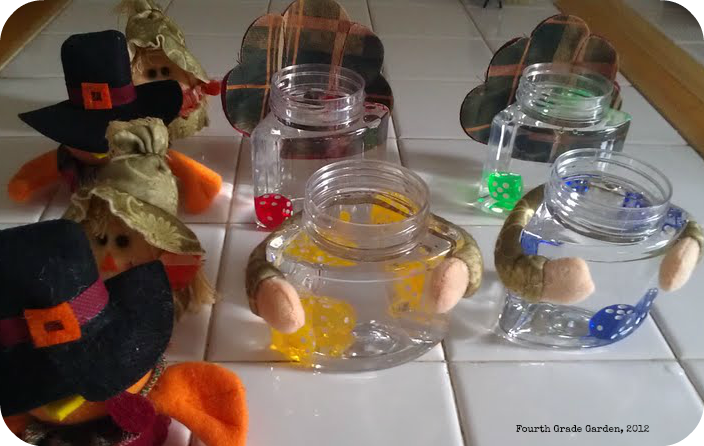 Also included are letter writing, stationary, and story element dice. 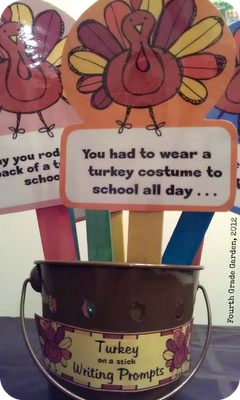 Check it out here at my Teachers Pay Teachers Store. 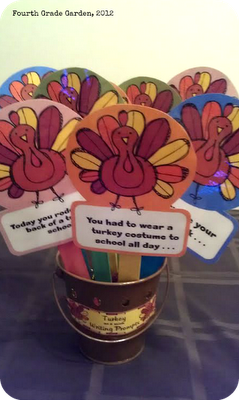 Want a copy of my Turkey Time Multiplication or Thanksgiving Writing Prompts? The first 3 people to comment will get a copy of their choice for FREE. Just tell me which one you want and how you will use it in your classroom! For everyone else, both products will be 20% off at my Teachers Pay Teachers store until the end of today (Monday, November 5th). Pop on over now! Want to see more Monday Made Its? What are you waiting for? 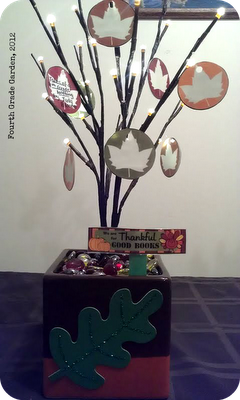 Head on over to Tara's blog for Monday Made it! I live for the weekends. Not because I want to be away from my classroom. No! Because I love planning for the upcoming week with my kiddos. I love sleeping in a little late, keeping on my pajamas a little longer than normal, and sitting in the peace and quiet while I relax, read, write, plan, create and blog. Next weekend is a 3-day weekend. 3-day weekends are obviously even better than 2. I think every weekend should be a 3-day weekend. You can get so much more accomplished. You can actually enjoy both Saturday and Sunday. Usually, Sunday is a little chaotic because all I can think of is trying to complete my to-do list before Monday comes. Having Monday looming over your head adds a slight amount of stress. Not much, but some. Not having to work Monday...now that makes Sunday so much more fun! Now...can you believe it's already November? 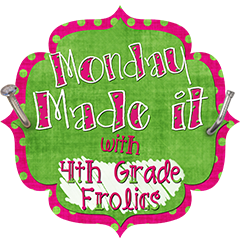 It's time to link up with the fabulous Farley from Oh Boy 4th Grade for her monthly currently! 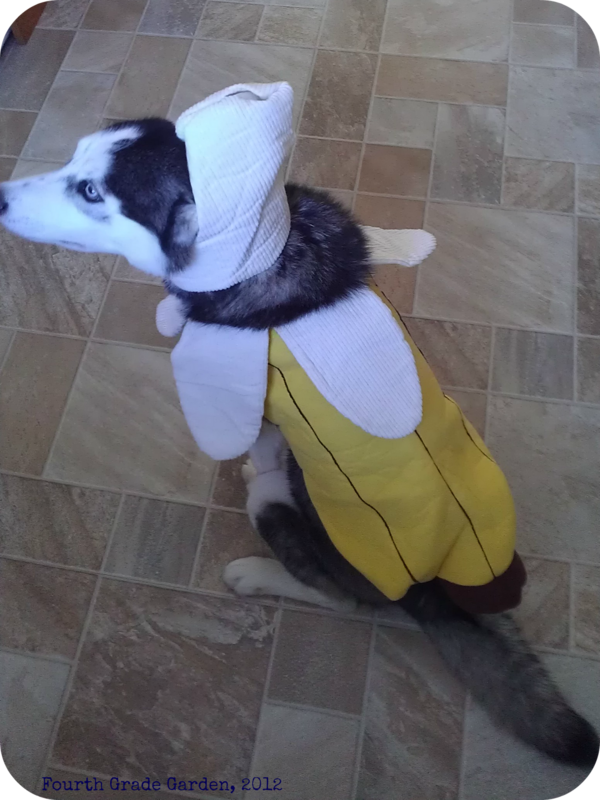 Here's a quick pick from Halloween. Our "little" Apollo "wanted" to be a banana for Halloween! Too bad he only kept it on for about 30 seconds. Have a wonderful and relaxing weekend!